The #1 Secret Your Banks and Creditors DON'T Want You To Know! This 2-minute, 52-second video reveals the secret about your accounts and payments that the "BIG MONEY" institutions are keeping from you. Before You Discover Payment Freedom, YOU'VE BEEN SELECTED! Every once in a while I’ll select someone to receive a free copy of my eBook, Great Credit for a LIFETIME – a $19 value – FREE. Today – YOU’RE THE LUCKY RECIPIENT! Just tell me where to send it. After you’ve done that, you’ll be brought to the page where you can discover how YOU can become COMPLETELY PAYMENT FREE! The Secret Your Banks & Creditors Are Keeping From You That's BLEEDING YOU DRY FINANCIALLY! Scroll down for the "Payment Freedom Timeline Estimator"
It's a secret that's been under your nose the entire time. It's a secret your banks and creditors never share with you because when you know it, YOU wind up with all the money instead of them. Imagine you're sitting down to pay your bills. But... this month is different. This month will be the LAST MONTH YOU'LL EVER HAVE TO MAKE PAYMENTS for things like your house, cars, credit cards, student loans! Starting next month, the thousands of dollars you've been spending every month on all of those payments will be yours - FINALLY! The bill payment process is designed by banks and creditors specifically with one goal in mind... TO GET YOU FOCUSED ON MINIMUM PAYMENTS! If you own a home, you remember sitting down at the closing where the title company flips through a stack of paperwork almost a foot tall -- and just tells you, "Sign here... sign here... sign here..." They know you're anxious to get the keys and when they come to the TILA paperwork (Truth In Lending Act document) they quickly point out -- almost under their breath -- "This document just tells you that when you make those 360 mortgage payments you'll wind up spending mumble... mumble... mumble..." (Mumbles are their way of glossing over the HUNDREDS OF THOUSANDS of dollars you'll pay over those 30 years). When you buy a car, it's kind of the same thing. All you want are the keys, and the car finance company knows it. And while you're still mesmerized by that "new car smell" they're flying you through the paperwork while you're eager to take possession of your new wheels. When you get a student loan, you don't even really know what the payments will be. Why? Because it's most likely the first of several and all you're thinking is, "When I graduate and get a REAL job, I'll be making plenty of money. So... who cares what the payments will be?" Think about it. When you look at your credit card statements, what payment choices do you see? They only show you two... the minimum payment (which is usually only about 2 - 3 percent of the total balance) -- or pay the total outstanding balance (usually hundreds - maybe thousands - yeah like you can afford to pay that - right!). Just because you're given 30 years to pay off your mortgage, 5 years (give or take) to pay off your car and student loans, and who knows how long to pay of your credit cards, DOESN'T MEAN IT HAS TO TAKE YOU THAT LONG! The truth is that you can pay off all of those accounts in a fraction of the time they give you. But why don't you? Why don't you pay off all your debt accounts faster than you are right now? Is it because you "think" you can't afford to? 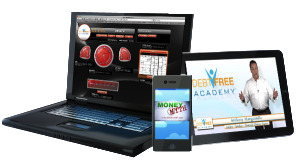 I would firstly like to say a BIG THANKS, and WOW, for your DebtFree Academy website and videos. There is SO MUCH amazing financial education out there and so many valuable lessons you are teaching us!" [The DebtFree Millionaire System] is easy to understand and you are not blinded by terminology. It will wake you up to what is really going on around you and help you set a course for your future financial security. [It] will change your life. Don't Buy Into The Payment Mentality! [Paid off] 2 car notes, two credit cards, and a personal loan. My wife an I were able to implement a systematic plan to eliminate our debt. We are now able to save and invest $3,500 a month. We are now saving and investing at a rate that is almost unbelievable. You're working your tail off every day, and all you want out of life is a for all that effort to generate a certain kind of lifestyle. That, my friend, is TOTALLY reasonable! When you look at your budget, you tend to focus on what's left over after all your bills have been paid. Because it's that amount that will fund the lifestyle you deserve. And, it's natural to think of making that amount - your lifestyle funding amount - as large as it can be. But lowering the amount of the checks you write is something you have more control over. So, you write out the checks for the smallest amounts you can, breath a sigh of relief because you made it another month, and then begin thinking of what you can do with the amount that's left over. I mean, isn't the amount that's left over the most important number on your budget? NOT! Common budgeting strategies have you focusing on the wrong number... that bottom number that tells you how much you have left over after you've paid all your bills. And your primary goal is to make that number, the amount of money you have left over after paying all your bills, as large as it can be. Take a minute and think about your numbers. The next question is – How much of that small fortune have you kept? I know, but you had payments to make for the things you want – right? The fact is YOU DO DESERVE those things. But you don’t deserve to sign your life away for them. Credit card payments are based on balances that can change at any time. As a result, each month the payment is calculated based on the current balance. Bottom line, the "minimum" payment will always include - essentially - the same proportion of interest and principal. That's why the average credit card can take 20 - 30 years to pay off when making only the minimum payments. How Can You Escape The Monthly Payment Trap? Grab a Piece of Paper and a Pen or Pencil... You're Not Going to Believe How Simple This Is! When you have a grand total... multiply it by 2, and save that number for step 3. If you're paid weekly - look at your pay stub (or direct deposit amount) and multiply that amount by 52 weeks (the number of pay periods in which you receive that amount. If you're paid be-weekly, take the net amount and multiply it by 26. STEP 3: Divide the amount from Step 1 (the amount where you added up all of your outstanding debt amounts to get a grand total you owe, and then multiplied it by 2) - by the amount from Step 2 (your "Net" annual income). STEP 4: The answer you get will be the estimated amount of time in which you'll BRING HOME TWICE THE AMOUNT YOU OWE ON ALL YOUR DEBT ACCOUNTS! On average this number is between 5 - 7 years. Yours may be less, it may be more. Whatever that number is, that's the estimated timeframe it would take you to reach your PAYMENT FREEDOM DATE! 6.86 years is the estimated payment freedom timeline! 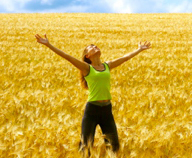 In a little less than 7 years all accounts could be paid off, and payment and debt freedom can be achieved! In 7 years more than twice the amount owed will be "deposited" into the account paying the bills. All that needs to be done is a proper redirecting of the cash flow to achieve debt and payment freedom! Credit can be a rather confusing issue. Is it a score, a report, some way to qualify for a loan? I mean... what is it anyway? "Your credit score is a reflection of your credit report, and your credit report is a reflection of your financial circumstances and behavior over a period of time." While it's obviously important to make every effort to improve your score, you need to understand that your "credit score" is merely a reflection of your report. And while there are strategies you can employ to ensure the accuracy of your report, taking every step to make sure your personal financial circumstances and behavior are in the best shape possible is the very best place to start. If you improve your score by improving your report, and you don't improve your financial circumstances and behavior, those improvements will only be temporary. This is because poor financial circumstances and behavior will eventually undo any effort you made to correct your report, and then ultimately, your score. Before you go, don't leave empty handed. YOU'VE BEEN SELECTED! Remember our budgeting story, and how you're always trying to make that bottom number to be as big as it can be? Well... right there is the secret to discovering how to become debt and payment free as fast as possible. You see, debt is usually proportionate to income. You've probably already experienced that. Remember when you qualified for your mortgage or car loan (heck, even credit cards consider your income when they decide how much "credit" they're going to give you)? So, chances are you already possess the resources to successfully redirect your personal cash flow towards achieving the debt and payment freedom timeline you just calculated. But, what has been the cause of your current cash flow directing efforts? I'd like to say it's all just simple math. And while it is (for the most part) there's also a psychological aspect to what causes you to make the cash flow directing decisions you've been making all this time. You've been conditioned by a number of people, and a number of institutions and social pressures, to spend money the way you do now. And it will take a little more than simple math to change that. Over the past 20 years, I've seen people "learn the math" to successful cash flow directing, only to wind up back to where they started. You see, the excitement you experience when you realize how fast you can become debt and payment free will only last a short time. This is because - after you've learned the simple math - you go back to swimming in the social and cultural pressures that got you to where you are now again. So, what can you do...? You can click on the "Become Payment Free" button you've seen on this page and find out. You need to put some "mental muscle" to the "simple math" in order to become - truly - payment free. You need "wealth accumulation habits" instead of "payment accumulation habits!" Debt and payment freedom can become a reality for you and your loved ones. All you need is to discover the SIMPLE MATH behind redirecting your current cash flow and stopping the financial bleeding. Click the "Become Payment Free" button to find out about how you can put the simple math you just discovered to work for you, and begin your journey to the freedom you know you deserve! The DebtFree™ Academy is different. Discover how it got started and who Anthony Manganiello is. Find out what other folks - just like you - have to say about the DebtFree™ Academy. Access Your DebtFree™ Millionaire System Here.